For weeks (okay, months) I’ve been meaning to link to this thought-provoking post at BLDGBLOG, written by Geoff Manaugh. It’s about ancient routes all around us — at Monticello and in Vermont, San Francisco and Australia. Great images and comments at the bottom. Perhaps because the United States is a young country, we don’t seem to think much about our old roads. But to me they’re among the most evocative features of the American landscape. 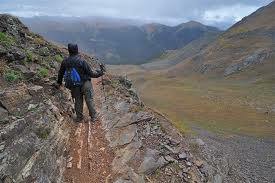 I started writing my first book, Rolling Nowhere, in the Colorado Rockies. A favorite afternoon hike was up the Columbine Lake Trail, east of Tabernash. Part of the route is over what guidebooks identify as an old Jeep trail – but when you get near the summit and see the remains of a couple of very old switchbacks, clearly built by hand with a lot of digging and stacking of rocks, you can see that it was a wagon trail long before Jeeps arrived on the scene. On the Columbine Lake trail. Now I live in New York City, where you can also find a lot of previous road infrastructure. Some of it is obvious and celebrated, such as the new High Line park which occupies a long stretch of former elevated railroad. Other structures are obscure and raise more questions than they answer, such as the sealed-off entrance and exit ramps you find near some of the older highways. I love the way Tom Wolfe chose such a ramp for the scene at the beginning of The Bonfire of the Vanities: his hero, lost in the Bronx on his home from Kennedy Airport, pilots his Mercedes up one of them and, in the glooms, hits a young man. From a forgotten stretch of road in a forgotten neighborhood, the future unfolds. 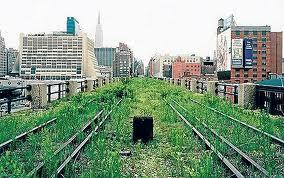 The High LIne, before it was reborn as a park. I have read all of Ted’s previous books and most of his articles (I am suspecting the section in his new one about truckers in East Africa is a “re-use”, but it was truly worthy). For an amazing and historic history of an old road in the Tri-State area, check out Hine, Charles Gilbert. The Old Mine Road. (New Brunswick, New Jersey: Rutgers University Press, 1908). ISBN 0-8135-0426-0. It tells the story of how Dutch settlers — that primarily used the Hudson River as their primary arterial — created a road connecting Kingston NY southwest to the Delaware River and the Copper mines that were in the hills of NJ. Most interestingly, the road was dis-used by the early 1900’s (the railroads had superceded many overland routes by then) and this book is one of the first attempts at preserving history only 100 years ago!